Despite its flaws, this year’s budget proposal by the President should fare better than last year’s. That one went down to defeat in the Democratic-led Senate 99-0 and 414-0 in the House. He then proposed a budget of $3.8 trillion, 3.2% bigger than last year’s. It will hike spending by $247 billion for the next two years over the projected “baseline.” The increases for 2014 would include $76 billion for “preschool for all,” and other initiatives, like $40 billion for “fix it first” infrastructure projects. It would create a National Infrastructure Bank (more bureaucracy), $1 billion to set up 15 “manufacturing innovation institutes” (even more bureaucracy) and a new version of “Build America Bonds.” It would increase tax revenues by $1.14 trillion over ten years. If government is getting out of the way, one wouldn’t know it based on his proposals. Deficit reduction would amount to 1.3% over the next ten years. The national debt would continue to rise. Despite words to the contrary, Mr. Obama insists that government is the way. It was amusing that papers like the Financial Times, the New York Times and the Wall Street Journal emphasized the risk the President took with his proposed budget. The risk to which they refer was the nominal one of using “chained CPI,” rather than the traditional Consumer Price Index for determining increases in annual adjustments for programs like Social Security. Chained CPI was created by the Bureau of Labor Statistics (BLS). It uses a time series of price levels of consumer goods and services. The real effects are tiny. A Social Security recipient of a $1000 check could expect $997.50 instead. Real reform would have meant increasing the age of eligibility and implementing some form of means tests. The President’s budget calls for more spending than that proposed by the Democratic-led Senate. Alan Blinder referred to this budget in Friday’s Wall Street Journal, as “…a reasonable model of what might pass for a compromise in a less partisan Congress.” If this is reasonable, I shudder to think what an unreasonable budget proposal would entail. 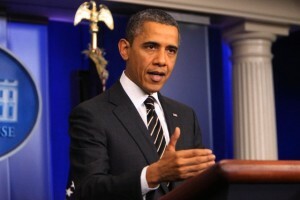 Mr. Obama makes no pretense at balancing the budget. Deficits come down under his proposal, but they persist as far out as a reasonable person is willing to look – more than ten years. It ignored the least painful and fastest way to reduce deficits, which is to accelerate economic growth. When economies recover smartly, Washington bureaucrats inevitably underestimate growth in tax receipts. The message from the President is that government remains the engine of economic growth. The $1.14 trillion in tax increases, coupled with $600 billion increase passed to avoid the fiscal cliff in December, will retard, not boost, growth. Additionally, economic growth will struggle against the headwinds caused by the adoption of the Affordable Care Act and all the taxes associated with that bill. People may go hungry, but government will not starve. On Friday, in his New York Times op-ed, David Brooks noted that under the President’s proposal domestic discretionary spending would be the lowest since the Eisenhower’s years – a problem because “America faces two giant problems: social unraveling today and cataclysmic debt tomorrow.” What Mr. Brooks ignored is the reason why discretionary spending has fallen as a percent of the overall budget. The answer is because mandatory spending has risen from 25% of the Federal budget in 1962 to 56% in 2011. Mr. Brooks is willing to accept more debt today to help solve issues like unwed mothers, men dropping out of the workforce and students failing to complete college. There is no question as to the magnitude of the two problems Mr. Brooks cited. They represent clear and present dangers. But social unraveling has many fathers, including a morally defunct entertainment industry, which is lauded in a politically correct media. It is also a consequence of government’s fostering dependency – think Julia’s world. An emphasis on personal responsibility would help resolve the social unraveling more quickly. Government intervention is not the answer to today’s ethical lapses. The fifty percent increase in disability roles has little to do with more people being disabled; rather, it reflects an increase in dependency. Debt may be “tomorrow’s” problem. But, if the Fed stops printing and if it lets interest rates reach a natural equilibrium, it will quickly become today’s problem. In former times, the Country faced severe financial disruptions that did not create the problems we have today. In 1987, the Dow Jones Average lost 22.5% in one day. That would be equivalent to the Averages losing over 3300 points today. People were shaken; it was a frightening time, but the economy did not collapse. Then, between March 2000 and March 2003, the S&P 500 declined more than 50%, and the NASDAQ fell by 85%, causing $6 trillion in equity losses, yet the economy only suffered a ripple. Things are never the same, and I understand the risk of such comparisons, but the big difference is that Washington did not view those crises as opportunities to exploit. While Democrats and their buddies in the media like to portray Republican’s objections to tax increases as favoring the rich and as mean-spirited aversions to social Reform that simply is not true. The two principal arguments in favor of lower tax rates are that such policies help keep government less intrusive and that they promote job growth. Warren Buffett cries crocodile tears, as he admonishes Republicans for not paying more in taxes; yet instead of writing a bigger check to Uncle Sam, he puts his money into charitable trusts. Why? Is it not possible that he believes that private charities are both better fiduciaries and better dispensers of his wealth? Government has been fiscally reckless for many years across administrations of both Parties. A byproduct has been a rise in crony capitalism, which threatens our economy and moral standards. Reform is needed, and the only reform that makes sense, in this regard, is term limits. Any loss of efficiency would be more than offset by more open and honest governance. The message in the President’s budget is a call for bigger government and greater redistribution. Increasing dependency may score more votes, but it does little for the young and the poor who are aspirant. It is those who should be encouraged. Implying that $3 million is all one needs to retire simply reflects an innumerate mind. Three million dollars is, as Friday’s editorial in the Wall Street Journal noted, “…roughly the value of a California police sergeant’s pension if she works for thirty years, retires at age fifty and lives to normal expectancy.” Two and a half percent annual inflation erodes the dollar by fifty percent in a generation. Defined pension plans for public sector workers are no longer affordable. The end may come gradually, or it may come after – to use David Brooks’ word – a cataclysmic event. Given the reaction of several House and Senate Democrats to President Obama’s token reform measure of using chained CPI for Social Security payments, it appears that it will take bankruptcy on a major scale for politicians to realize the true financial state of our entitlement programs. What is true for Democrats is also true for most Republicans. In 2005, when George Bush attempted Social Security reform, his efforts were similarly sabotaged by his own Party. Personal savings is what is needed, and the President’s budget discourages savings exactly at the moment when the people need it most. On March 11th, I wrote a piece, “Coolidge a Primer for Obama.” It was largely drawn from the informative book, Coolidge, by Amity Shlaes. In stark contrast to President Obama, Mr. Coolidge’s, 1929 fiscal budget was lower in absolute dollar terms than his 1923 budget. I will grant that the problems Mr. Coolidge faced on gaining the Presidency in 1923 were not as formidable as those that faced Mr. Obama in 2009. Nevertheless, Coolidge had his challenges – corruption within the Harding administration, legacy debt incurred during World War I, an over-indebted Europe and sluggish economic growth at home. He rid the country of corruption, erased our debt and presided over one of the greatest growth spurts in America’s economic history. He did so by limiting government and lowering tax rates. Coolidge’s years as President proved to be among the Country’s most productive, especially in terms of innovation in consumer products. When he became President only 30% of U.S. homes had inside plumbing. When he left, 70% of homes did. Economic growth, during his six years, averaged better than 5% per year. The message in the President’s budget was one of continued spending and further tax increases. Federal spending is projected to grow fifty percent faster than growth rates in GDP and inflation. More than anything, it is a document that indicates how far to the left we have drifted. And with that drift has come pessimism about the future of the country, especially for the young to do better than their parents. The contrast with the optimism of the 1980s is striking. Ronald Reagan signaled a sharp departure from the gloom and cynicism of the 1970s. Since Mr. Obama assumed office four years ago, the country has grown more despondent, marked by a declining workforce and a growing number of people on food stamps and disability. The President has advocated a “Julia’s world,” in which the government will look after its citizens from cradle to grave. There are many who find such promises comforting, but more who see them as patronizing and stifling. Keep in mind, those are the same promises made by both Communists and National Socialists in the years between the Wars. Mr. Obama is a great speaker, and sells his message well. But the benefits he offers come, definition-ally, with a loss of personal freedom – the value of which can only be realized when it is lost. The history of America is the story of a successful struggle for independence and individual freedom. The President’s message leads in the opposite direction. The baseline is an accounting method used by the federal government. It takes current spending and then multiples that umber by the assumed inflation rate, times the growth rate of the population. If only we could do the same with our household budgets. Data from Congressional Research Service, “Mandatory Spending Since 1962,” March 23, 2012.